KIEV, Ukraine -- Ukraine hopes to secure a new $12 billion lending program from the International Monetary Fund for the next 30 months, Deputy Prime Minister Serhiy Tihipko said Tuesday. "We will present a Ukrainian draft program for cooperation with the IMF over the next 2.5 years. It's a new program aimed at supporting economic growth," he said ahead of a trip to Washington, D.C. Thursday for talks on a new agreement with the fund. Mr. Tihipko added that he hopes a deal will be reached at the beginning of May, with the first tranche disbursed in June. The IMF had released around $11 billion of a $16.4 billion program to Ukraine before freezing lending in late 2009 after large spending increases were passed into law. The country badly needs to secure further lending to revive its economy after a 15% contraction last year. The Ukrainian government has pledged to draft a budget with a deficit of no more than 6% of GDP in order to unlock further lending. Whether Ukraine can achieve a relatively balanced budget will largely depend on the results of negotiations on the price of imported Russian natural gas. Large subsidies to Ukrainian consumers mean the price of gas is a significant burden on state finances. Ukrainian Prime Minister Mykola Azarov said Tuesday that negotiations on a lower price were "tough" ahead of a meeting between the two countries' presidents Wednesday. "Everything depends on the good will of Russia," Mr. Azarov said at a meeting with Ukrainian industrialists, adding that he hopes talks will end with a mutually beneficial agreement. Russian President Dmitry Medvedev will fly to Kharkiv Wednesday in an attempt to finalize an agreement with Viktor Yanukovych, his Ukrainian counterpart, on a discounted price. Under a contract signed by former Prime Minister Yulia Tymoshenko in January 2009, Ukraine moved to a market-based price this year of $305 for 1,000 cubic meters in the first quarter. The new president, elected in February, and the government he formed last month argued that the gas contracts are unfair and have pushed for a reduced price. Ukraine is seeking a discount of one-third, which would save around $3 billion this year. Concessions could help Ukraine's crucial energy-hungry chemicals and steel industries drive an economic recovery. 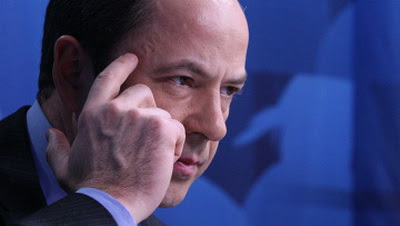 Mr. Tihipko said GDP growth could exceed the government's forecast of 3.7% this year.